An Interaction Occurrence (or InteractionUse) is a reference to an existing Interaction (Sequence) diagram. Interaction Occurrences are visually represented by a frame, with ref in the frame's title space. The diagram name is indicated in the frame contents. To create an Interaction Occurrence, simply open a Sequence diagram (preferably contained within an Interaction element) and drag another Sequence diagram (also preferably contained within an Interaction element) into its workspace. A dialog displays, providing configuration options. The resulting Interaction Occurrence acts as an invocation of the original Interaction. You use the Call tab of the element Properties dialog to set up the actual arguments of the Interaction and also to change to a different associated Interaction element. The following figure illustrates the use of an Interaction Occurrence in another Interaction (Sequence) diagram. You can display the sequence represented by the Interaction Occurrence by double-clicking on the element. 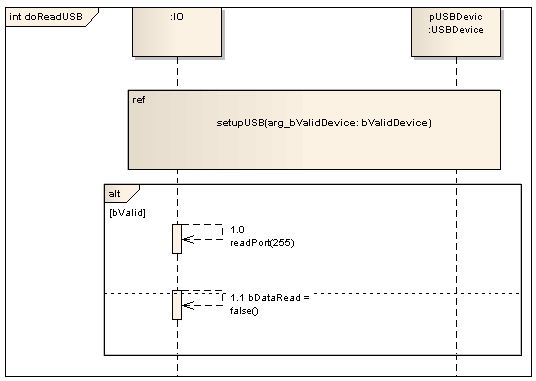 The behavioral code generation engine expects the Sequence diagram and all its associated messages and interaction fragments to be encapsulated within an Interaction element (such as doReadUSB in the example below). An InteractionUse refers to an Interaction. The InteractionUse is a shorthand for copying the contents of the referred Interaction where the InteractionUse is. To be accurate the copying must take into account substituting parameters with arguments and connect the formal gates with the actual ones. It is common to want to share portions of an interaction between several other interactions. An InteractionUse allows multiple interactions to reference an interaction that represents a common portion of their specification.